National Elk Refuge is more than just elk. While elk are the highlight of a trip to the National Elk Refuge, visitors can also get a close-up view of bighorn sheep and other wildlife. To see the bighorn sheep, head east through Jackson on Broadway. Instead of turning at the antler arch toward Grand Teton Park, continue straight on Broadway. You will pass the hospital on your left and will enter the Refuge several blocks further on. On a tip from a friend, we headed to the National Elk Refuge north of Jackson on Saturday. However, we weren’t there to see the thousands of wintering elk. We were hoping to see bighorn sheep. We had gone about two miles on Refuge Road on the east side of the refuge when we saw the bighorns below Miller Hill. Honestly, it didn’t take much skill. About a dozen rams were right on the road, licking salt that dripped from the cars. We counted about 40 more sheep on the slopes of Miller Hill. 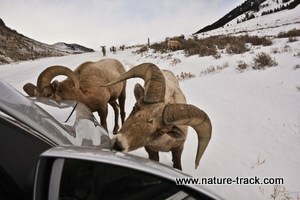 When we stopped two young rams brazenly walked up to our car and began to lick the ice around the tires. It is called the National Elk Refuge for a reason. For over 100 years, the refuge, located just north of Jackson, Wyoming, has focused on providing wintering habitat for half of the Jackson elk. The elk are an incredible sight. We could readily see huge segments of the 5,700 elk currently on the refuge as we drove along Refuge Road and later along Highway 191 to Grand Teton. If you have heard about the refuge at all, it is likely you have heard about the horse-drawn sleigh rides to see the elk. Hundreds of visitors a day flock to the refuge just to ride the sleighs and see the elk up close. There are also free naturalist-led tours during the winter months available by reservation (see the website: http://www.fws.gov/refuge/national_elk_refuge/). There is a lot more to the National Elk Refuge than elk and winter though. Besides the incredibly cooperative bighorn sheep, seasonally there is potential to see pronghorn, mule deer, coyotes, wolves, mountain lions, bison, black and grizzly bears and moose. With over 170 bird species found on the refuge at different seasons, there is great opportunity for the birder as well. Some of the most visible species include: trumpeter swans, bald eagles, sandhill cranes, long-billed curlews, sage-grouse, and waterfowl, with Canada geese, gadwall, mallards, ring-necked duck, green-winged teal, cinnamon teal, and Barrows goldeneye the largest contributors. During the winter Refuge Road is only open for public use for 3.5 miles. But during the summer there are many miles of roads within the refuge that are open to the public. The Flat Creek road traverses the refuge and deposits visitors at Kelly. Access to the national forest is available off both the Flat Creek and the Sheep Creek roads. There is an intentional emphasis on roads here. With over one million annual visitors, and being positioned literally minutes from Jackson and Grand Teton National Park, refuge managers have decided that with a few exceptions, off-road hiking is not permitted. We are always looking for great wildlife opportunities during the winter time and this is one of the best that we found. It is a great summer destination as well, one that can add a lot of dimension to our annual trips to Grand Teton Park.